If you suffer from hyperpigmentation (darkening of the skin) then you are probably looking for any treatment to help lighten up your skin. If you fit into this situation then you've probably at least heard about hydroquinone. But is using hydroquinone actually safe to use? In this article, we are going to explore that very question. Hydroquinone is an effective skin lightening but it comes with a lot of risks and there are better options available that don't damage the skin. So is it safe? Sort of, it depends on how long you use it. Is it effective? Yes, but there's also more information there as well. If you aren't really sure what hydroquinone is allow me to fill you in. Hydroquinone is a topical agent that you can put on your skin and it is primarily meant to lighten your skin. This may sound like a godsend, especially if you have hyperpigmentation, but don't get sold on it right away. You need to have some more information before you determine if it's worth using. Hydroquinone works by reducing the number of melanin in your skin cells. It does this by inhibiting an enzyme known as tyrosinase which blocks the production of melanin into your cells. Melanin is the natural pigment that your skin cells produce and it is this ingredient which helps determine the color of your skin. When you go out and tan the sun sends signals to your body to increase the number of melanin in your skin (predominately to protect your cells) and this causes your skin to become tan. But that's not why people use hydroquinone! It's most often used to treat hyperpigmentation disorders which result in blotchy and uneven skin tones. Conditions such as acne, melasma, keratosis pilaris, darkening of intimate areas, and the yellowing progress which occurs with aging are all reasons that people want to use skin lighteners. It's often prescribed by Doctor's and dermatologists who want to help patients, but usually because they don't know about better options. It's also particularly attractive if you are on a budget. Because prescription medications are often much cheaper than more expensive beauty products which contain natural skin lighteners (we will talk more about those later). But, the real question here is whether or not hydroquinone is a viable option for those suffering from hyperpigmentation. After all, it's important that something works but it's also equally important that it doesn't do more harm than good! And, while hydroquinone is definitely effective (make no mistake that it will lighten your skin) the side effects of using it may be less than desirable. The melanin in our skin serves as a protective barrier to prevent skin cancer! If you suddenly suppress the ability of your cells to produce melanin, the very thing that fights off cancer, doesn't it make sense that this might put your skin at increased risk? The answer is not exactly clear, but we do know that it probably does increase (slightly) your risk of skin cancer with prolonged use. In addition, it also frequently causes irritation whenever it is placed on the skin. Because of this, Doctors frequently don't recommend that you use it on a consistent or daily basis. In fact, they like you to only use it for weeks to months at a time and require that you take frequent breaks in between. Granted, the irritation from hydroquinone may actually be due to the fillers/binders/dyes in the cream itself and not the medication, but it's still worth discussing. Part of the problem with getting your skin care products through pharmaceutical companies is that they aren't really concerned with your skin so much as they are the main ingredient of their medication. They often put ingredients to help increase absorption and stabilize their medication and these ingredients are often caustic to the skin. Beauty product lines, on the other hand, usually take great care to try and avoid harmful chemicals inside of their products. 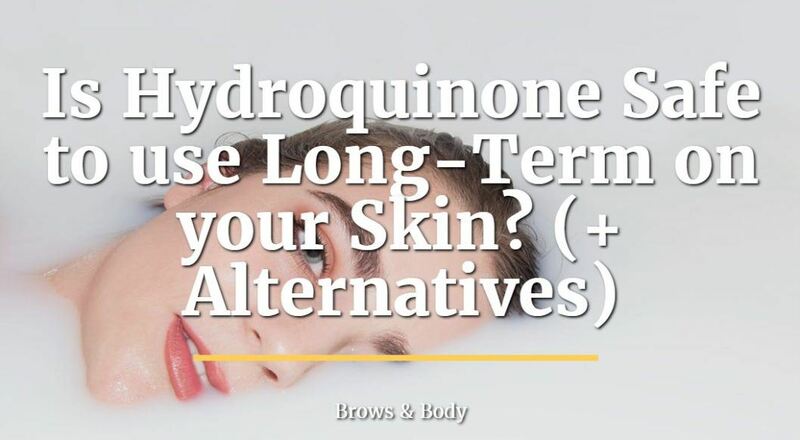 Hydroquinone is also not the best option to use for skin lightening because it can potentially damage and kill off your melanocytes (the cells that produce melanin). You may want to slow down the production of melanin, but you definitely don't want to unnecessarily kill off these important cells. Are you doomed to have pigmented skin for eternity? The answer is definitely not! In fact, there are many different options that are available to you that work almost (if not just as good) as hydroquinone and that carry far fewer negative side effects. The only downside to these products is that they are often much more expensive than other the counter or prescription hydroquinone. But, when you consider that your skin is worth the investment, it makes purchasing these ingredients a no-brainer. Kojic Acid - Kojic acid is another natural ingredient which is formed during the fermentation process of rice. It works to lighten your skin by inhibiting tyrosinase. Kojic acid is often found in soaps, face washes, and other products which means it can be used on your entire body. If you are attempting to lighten more than just your face then kojic acid may be the best option for you. Arbutin - You can think of arbutin as a natural hydroquinone. It works by blocking the same enzyme as hydroquinone but it doesn't come with all of the irritation that people get with hydroquinone. It's also not as powerful which means it can be used more frequently and you don't need to take breaks. If you want to use a product with arbutin in it then I recommend a product such as this. Vitamin C serum - Vitamin C is a naturally occurring vitamin which has skin lightening properties. Using Vitamin C serum (high-quality ones) can help lighten your skin naturally and improve skin texture as well. If anti-aging and taking care of your skin is your primary goal then vitamin C is probably your best bet. I personally love this vitamin C serum. Niacinamide - Niacinamide is vitamin B3 which can be formulated and added to beauty products. Vitamin B3 is incredibly important for your skin and it has been shown to act as a powerful anti-inflammatory. It also helps reduce pigmentation by naturally reducing the aging process. Products which contain niacinamide are often expensive but also benefit your skin in other ways. I recommend looking into products such as this one. While hydroquinone is definitely an effective tool for helping to lighten your skin, there are safer alternatives which work just as good. We don't have much information about using hydroquinone for children, but there have been some case reports of kids who consume hydroquinone and suffer from side effects such as seizures. One of the potential reasons that hydroquinone can cause these issues is that it can sometimes contain mercury which is a known toxic heavy metal. Do you remember when you have to wear gloves when dealing with mercury in chemistry class? Sometimes people put mercury in skin lightening agents because it is known to bleach the skin. The only problem is that mercury is toxic and should absolutely not be handled with your hands or ingested. Mercury toxicity is the very thing that causes mad hatter disease and causes problems with the brain! If you are interested in using it for your child then it's probably best to use something that is safer and won't cause any damage! When in doubt you can always talk to your pediatrician as well. Can you use hydroquinone if you are pregnant? It's probably not a good idea, but technically it may be safe. When it comes to pregnancy and putting medications on your skin, you always need to be concerned about how much is being absorbed into your body. When you put hydroquinone on your skin, about 35 to 45% of the dose that you use will be absorbed and some of that may make it to your baby. There have been limited studies which test to see if hydroquinone is dangerous so we don't have really good information. When in doubt it's probably best to avoid it in favor of more natural options that don't carry any potential risk for your baby! Why would pregnant women want to use hydroquinone? It turns out that one of the most common hyperpigmentation conditions stems from pregnancy and it's known as melasma. Melasma is triggered by excess estrogen stimulation on your melanocytes and excess estrogen happens to occur secondary to pregnancy! So many women suffering from melasma may be tempted to use hydroquinone to slow down this process. If you are pregnant and you are suffering from melasma, there are many other options that you can use to try and normalize your skin tone. Hydroquinone is a skin lightening agent which is effective but not necessarily safe to use, especially for long periods of time. While it does work, there are various other natural products which can be just as effective and which don't carry the same potential risks! Using hydroquinone long term can potentially exacerbate hyperpigmentation disorders and cause local irritation to the skin. Did you have any negative side effects? If so, what did you experience?